BORG hub progress - first wheel built. Well I while back I posted about an idea I had well there has been progress. There are proper drawing now and the specification is being finalised. First of the premise. There are many hubs on the market but when it comes to triplet hubs there is nothing. Tubeless tyres cause a savage tension drop on the spokes so a triplet laced wheel helps to overcome this. However to avoid a loss in lateral stiffness the NDS flange MUST be placed 50mm from centre. Simple maths demonstrates this, it is not my opinion. Front and rear hubs use 2x NTN 6902 bearings running on an aluminum alloy 15mm diameter axle. The freehub body has 2x NTN 6802 bearings. 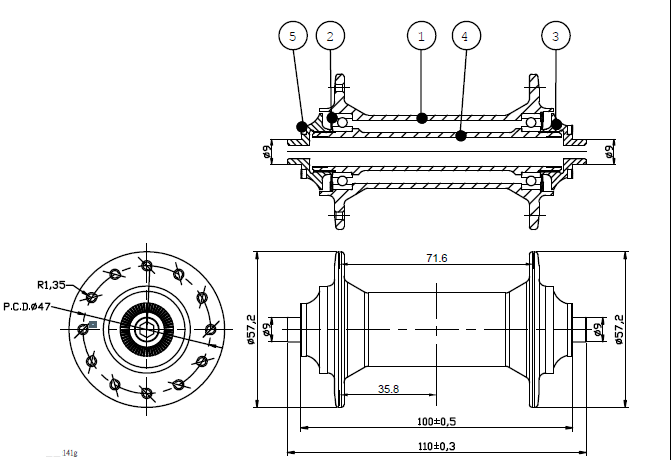 The bearings have the LLU contact seals and steel cages for increased longevity. LLB non-contacting seals may have lower drag but water can get in more easily. The extra drag of LLU seals is so small when the wheel is rolling I don't think it makes any difference to how fast you go but it does make a difference to the pointless test of how long a wheel spins for in a stand. I don't know about you but I get my wheels spinning by riding my bikes. NTN make there bearing to various tolerance standards I have yet to decide which one to go for. Bearing life is an issue for northern European cyclists. Some hubs have overcome this. DT Swiss have, but no triplet and the hub geometry on their rear hubs is rubbish. Hope are pretty good too but the rear NDS flange could be placed a few mm further outboard and again no triplet. Miche Primato hubs are very reliable but they are not perfect either. However, they are cheap, relatively speaking, so the disadvantages are overcome by that fact. The triplet hub Extralite have will result in a less stiff wheel than there standard hub so what exactly is the point. Gain in one way loose in another. I like gain. to cope with radial lacing the NDS rear flange is thicker and there is a bigger chamfer on the flange accounting from the large NDS bracing angle. The freehub will have 4 pawls and run in a 36T ratchet ring. More points of engagement sadly means a lower maximum torque rating for the hub, generally speaking. To get around that means the ratchet ring has to get bigger, to allow bigger teeth. That however means more mass. So there is a balance here to be struck. front hub weight is 141g (est) and rear is 255g (est). So not a weight weenie hub but I am not trying to recreate a Carbon Ti hub. What exactly would be the point in that? There is no reason why another version of the hub cannot be made with 17/38mm spacing for conventional drilling. Tension balance will depend on the rim ERD but for one of the wheels I intend to use it for it will be 66% ERD 580mm. Increasing the tension balance will reduce lateral stiffness and that is not desirable, is it? I have no idea of cost yet, well I do but I work out the spec first and let that dictate the price. It stops corner cutting. Of course, rims drilled for this type of hub and the bracing angles created are essential. That the other part of this project but a centre drilled rim is useable and many of the carbon rim manufacturers will drill for triplet if asked too. Given this is a custom hub, not some rebranded effort the MOQ will be significant. Hense I am likely to sell them as hubs alone. I have not got to a name yet, i have not even thought about it. Last edited by bm0p700f on Sat Apr 13, 2019 4:37 pm, edited 1 time in total. The rear hub's weight is pretty competitive for what it does, but the front isn't. Do you really need the front hub to be so big? And, will there be an XD freehub? I was about to comment, that the rear hub weight is pretty good, though the front looks a bit over-built. I assume they'll be available in several spoke options from 16 to 36? What will compatibility be like on that NDS rear flange? With some of the massive chainstays and the cut outs they need on the other side, will it catch? Yes there wil be an XD (specifially XD road freehub which I think is a bit different) freehub. the front hub deisgn is not finalised. the flange PCD may come down to 40mm but that wont save much weight. yes over built that the whole point of this hub. The 28mm bearing OD does mean a large bore shell for the front hub and I have no interest in using smaller bearings. Smaller bearings wont last as long even people think they last long enough. The other thing is a smaller bearing front means I have to stock another spare and that means more cost, stuck on a shelf and more chance I will be out of stock one day. These kind of bearings say NTN ISO grade 4 are not just available from simply bearings or the usual online shops. the NTN catalogue lists them as grade 0 so anything above that has to be specially ordered. Maybe Hambini knows more about this. a DT 240 front hub is 105g so we are not talking much here. Rear will be available in 24H drilling because its triplet. 27H means specially drilled rims. I might do that. That means the front hub is 20H only for a 20F/24R pair. 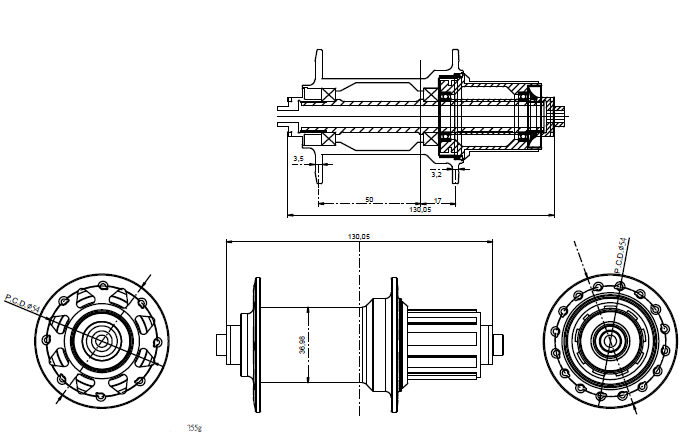 If I am able to proceed with a normal 1:1 lacing rear hub with 17/38mm flange spacing then 20H, 24H, 28H and 32H drillings would be available fornt and 24H 28H and 32H rear. but you see that gets expensive. There is a minium run per drilling and that will require far more cash up front that I will have. So one step at time. I am wheel builder not a millionaire and I dont have a millionaire investor either. Some chainstays are getting a bit fat but there should not be contact. something to look into but if its is a problem it wont be a wide spread one. 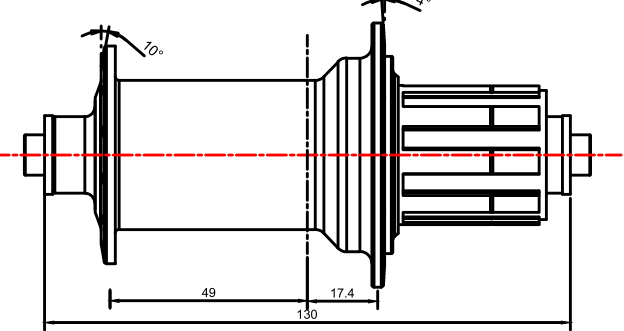 The flange size for the rear is dictated by the bearing size and the size of the ratchet ring. It should be possible to reduce the the NDS flange size. Mattr are there any particular bike you have in mind. There is a BORG disc brake ordered too. Different manufacturer. Delivery due October well the first batch anyway. 24H, 28H, 32H drilling. This has cost me more than I'd like but hey ho it only money. 59mm PCD flanges, centrelock only and J bend tyre flanges for convential 1:! lacing. Large flanges reduce braking loads on the spokes. 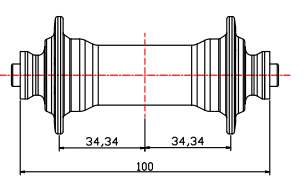 In fact if your ratio the flange size of a shimano C/L hub and mine you get a ratio of 1.31. That is the ratio of the torque applied at the flange by braking So the torque at the spoke hole is 31% higher with the shimano flange on my hub. So Shimano, DT Swiss hubs load the spokes more when braking which is not a big problem obviously but since I am starting from stratch and can have what I ant why not. So large flange it is. SKF 6803 2RS contacting seals used throuut out 2x front, 2x DS rear 1x DS rear and 2x freehub. The freehub is alloy the lockrings can be torqued past 40Nm if you have feel for this sort of thing. that limits or stops nothcing. I always do lockrings as tight as i dare when fitting a notch prone shimano cassette. The freehub has titanium pawl seats/ freehub core, 3 pawls ruuning in a 30T ratchet ring. that many not be as many points of engagement as some but the freehub mechanism can handle 330Nm of torque. Thats more torque than most road and MTB hubs can handle. Note how DT Swiss have there new E-bike 240 hubset. That means it can cope with a road e-bike or my 3.0l BMW (it an old one and it broken so it can definateley cope with a broken one). Cost would be around £200 per pair. Weight 430g but they are compatible with Q/R 12mm/15mm front and 142x12mm and Q/R rear. While it is possible to make a lighter hub it is not easy. getting a hub below 400g with a Q/R axle is expensive. Carbon Ti and Extralite have managed it but these hubs cost alot of money. Chris King R45 hubs cost alot of money and are 405g. The end caps uncrew with 5mm allen keys and it is a free axle type hub. Bearings just knock out with an extracter and press in with drifts. Maybe V2 will be a bit lighter. one step at a time. The whole reason for this disc brake hubs i have got fed up with DT Swiss. The hubs come in thru axle format for road freehub but many customers want Q/R so you end up selling them a hub with end caps they dont need making it too expensive. If you keep the end cap like I have you end up with a box full and make nothing on the hubs until you =sell the end caps which does not happen often. Freehub availability seems to be variable too which is pants if you need one. Novatec hubs are O.K but the bearings and freehubs dont seem to last more than one season of cross. The Miche hubs are good but they now do triplet lacing for there dic brake hubs - wrong so I am forced to have a hub made or stop building disc brake wheels as there is no hub I am truely happy with once my stock of Miche disc brake hubs runs out. As it happens Miche are making these. It just I had to order quite alot. Mattr are there any particular bike you have in mind. Not particularly, it's just i've had some bikes through my hands which i've noticed even conventional shimano or campag hub shells/end caps are pretty close. Cervelo (S5 i think) springs to mind as the last one i had and there have been a few others. Mostly the more aero orientated or full on TT/Tri frames. Like you say, unlikely to be anymore widespread than the wide/lenticular disc wheel thing from 3 or 4 years ago. With regards the NTN bearing question and ISO grades. You will find they are class 0/X unless you do a special order. The last time I enquired, the MOQ was 10,000. Generally, they won't deal directly with you unless you have a £100k spend with them yearly. You would probably have to go through Eriks/Brammer etc to source them. Based on loading calculations I did when I was looking to make my own hubs. The route I went down was 6803 on the front axle, 6903 in the rear hub and 6803 in the rear freehub. It's essentially the next size up. 17mm as opposed to 15mm. I don't know if you have looked at manufacturing tolerances but the axle on the front can be a PITA as the gap between lips might require grinding, I don't think you can achieve it on a lathe. Last edited by hambini on Thu Aug 23, 2018 3:13 pm, edited 1 time in total. fortunaltley I am not machining myself and it is being done my a much bigger outfit than me so they will help with the bearings. MOQ's of 1000 are not a big problem. Thats enough for 250 hubs pairs and 500 freehubs. I suppose thats the advantage of 6803 bearings all round. The cost reduction of the bearings by keeping one size might allow the new axle to be funded. however I would need 5x 6803 bearings on the rear axle to cope with the loads like on the disc brake hub. Remember we are at the drawing stage. There is a way to go. prototypes then testing........... the disc brake hub project is more delveloped and is based on a existing hub before evolving for V2. The road hub is almost totally from scratch as there is nothing to base it on. The only thing being used from the manufacturuers parts box is the 15mm axle. 6903 bearings could be used but then its a new rear and front axle as 6903 is a bit too big for the front. That could still happen. All I know it will happen at some point. Part of the project is rims too. It all well an good having a triplet hub but the 10 degree NDS bracing needs a rim drilled for that. It might even mean a new rim and extrusion mold in which case this will require some extra funding. In short I have to keep thing focused so it actually happens. The more that is added the longer the whole thing could take. Rear hub PCS 58/44mm. Ratchet rin is now 36T but bigger hense the bigger flange. Freehub is still 4 pawl. Ring made bigger so more teeth can be accomidated without reducing the max torque load. rear bearings 3x 6902 NTN and 2x 6802 NTN ( freehub) weight 263g. I am likely to create a conventional drilling version with NDS to centre spacing of 38mm. Cost around what a DT Swiss 350 hub would cost but as you can see they should have even longer bearing life. The point here is create a reliable hub for year round riding that is not too expensive and not too heavy. The prrof will be in the eating. a few sets will be made for testing. If anyone wants to help me test get in touch. I would love to help out with testing! I'm looking forward to picking up the Ambrosio P20s on PMP hubs you have built for me this week to put on the Roubaix build. finally I have met a weight weenie. Mattr that the idea. The narrower the endcaps are the wider your bearings can be placed. Don't overlook that. Unsupported axle is another cause for lost wheel stiffness. You can run a 10mm front axle with smaller 6900 bearings and still have high static loads. As a result you can bring the flanges wider (less chance for interferance with smaller diameter and less unsupported axle. This was the philosophy behind the Alchemy front hub. It's about 65g and bearings are right up to the axle ends. Resulted in very stiff front wheel and low weight. Nice to see rear right flange bumped to 17.4mm. That's class leading although my experience has been that 17.8mm will still clear rear derailleurs. I have that (Wheels Mfg hub) with a low profile carbon rim (25mm) which would be worst case and have no interferance. Might be cheaper to get one of the better Chinese rim makers on board with a custom drilling. They can get the specified angle working with an existing mold for now with low MOQ. People love carbon clinchers these days anyway! ergott the rim part is sorted. I already work and buy from one of the better chinese rim suppliers. They can drill the angles needed. The BORG50C will become triplet however a new rim is in devleopment. Again working with them on the design for a new mold. I build with front hubs like the alchmey - carbon ti and yes they build very stiff front wheels. The reason for the end caps on the front hub I am using exsisting end caps out of a parts bin. I have to control costs somewhere and everything for the rear is new. Also the difference in bracing angle for the alcmey hub and this one is real but for the kind of wheels I build is not releveant. It benefits the light weight low spoke count wheels with shallow rims. These are wheels I tend to avoid like the plauge for the reasons best highlighted in another thread we have both contributed to. Thats why the hub is the way it is. The issue with moving the rear DS flange further out is not the clearnace when everything is right but when everything is not. mech hangers can bend and the ham fisted can set there limit screws wrong. 0.4mm is not a lot but at the jockey wheel its nearly a 1mm what ever it works out to be and that can be the difference between a clash and no clash. Again maybe I should not comprise here but I am. Inside a Sram wheel, maybe Zipp also?